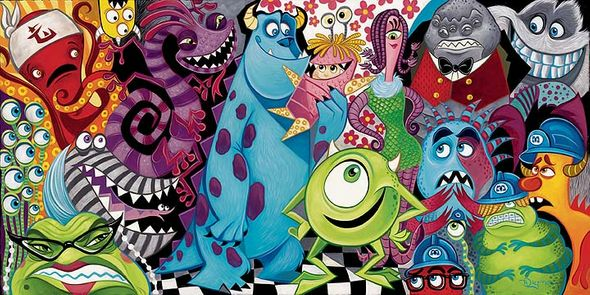 Home | Disney and Animation Art | Pixar | The Pixar Collection | Tim Rogerson | Tim Rogerson Signed and Numbered Hand-Embellished Giclée on Canvas: "The Scariest Little Monster" OFFICIAL | Gallery Direct Art | 800-733-1144 Free Ship. No Tax. Tim Rogerson Signed and Numbered Hand-Embellished Giclée on Canvas: "The Scariest Little Monster"
Edition: Edition of 95 and 10 COA included. About The Artist:As a rising star in the art world, Tim Rogerson casts his artwork with a very evident energy and passion. Inspired by the works of Edgar Degas and Malcolm Liepke, the North Carolinanative has embarked on an artistic journey that has taken him from Degas to Disney to darling of the industry. Home | Fine Art Prints & Limited Editions | Collectors Editions | Disney Fine Art | Tim Rogerson - Disney Editions (Click Here) | Tim Rogerson Signed and Numbered Hand-Embellished Giclée on Canvas: "The Scariest Little Monster" OFFICIAL | Gallery Direct Art | 800-733-1144 Free Ship. No Tax. Home | Disney and Animation Art | Disney Fine Art | Tim Rogerson - Disney Editions (Click Here) | Tim Rogerson Signed and Numbered Hand-Embellished Giclée on Canvas: "The Scariest Little Monster" OFFICIAL | Gallery Direct Art | 800-733-1144 Free Ship. No Tax. 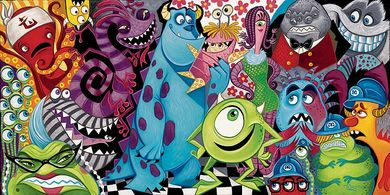 Home | Fine Art Prints & Limited Editions | Collectors Editions | Tim Rogerson | Tim Rogerson - Disney Editions (Click Here) | Tim Rogerson Signed and Numbered Hand-Embellished Giclée on Canvas: "The Scariest Little Monster" OFFICIAL | Gallery Direct Art | 800-733-1144 Free Ship. No Tax.